In 2012, more than 12.2 million recreational boating vessels were registered in the United States. Boating is one of the premier pastime pursuits of southern Californians with the easy accessibility to lakes, bays, and the Pacific Ocean. If you are considering purchasing a boat this year, just as important as the model is where you will harbor it off-season. In the Colton area, boats are not allowed to be parked on trailers along streets or in driveways. The alternative is to devote one bay of your garage to boat storage. It’s usually not feasible to accommodate the length of the boat or sacrifice needed car parking space. Vines Storage in Redlands offers flexible boat storage, trusted security with keypad entry, and ample customer amenities. Its protected ground floor indoor storage provides easy access to your boat and added protection for the hull and engine, which can be damaged when lifted into stacked dry dock storage. Read on for additional considerations for boat storage and ample reasons why Vines Storage is the best choice for your new boat’s second home out of the water. Verify the actual size of your boat. Measure the length and width; including the trailer dimensions, to be sure you rent the adequate size of unit. Factor into your calculations any additional equipment that might be stored behind the boat (inner tubes, large coolers, etc.) to make sure it is contained within the designated parking space without any overhang. Look at the turning radius and access space to be sure you can easily maneuver your vehicle. 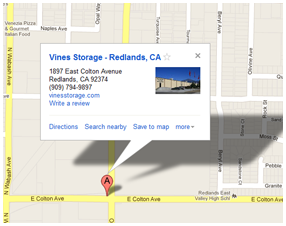 Vines Storage offers some of the most generous-sized units in the Redlands area. Understand the terms of your lease. Vines Storage offers flexible leasing arrangements, including month-to-month and long term. Consider if you will have your boat docked at a marina during the summer or if it will be stored in dry dock. Remember the fees to dock at a marina are often quite costly. Vines Storage has 24-hour entry and exit access via secure keypad entry for your convenience and peace of mind. Indoor storage during the season also helps protect your boat exterior from algae growth and the grimy weather-related film from the weather that can accumulate on boats stored outside.